Dome Cap Pink Ribbon Cup Only $4.99! Down From $19.99! Ships FREE! You are here: Home / Great Deals / Dome Cap Pink Ribbon Cup Only $4.99! Down From $19.99! Ships FREE! GearXS has this Dome Cap Pink Ribbon Cup on sale for $4.99 (Reg. $19.99)! 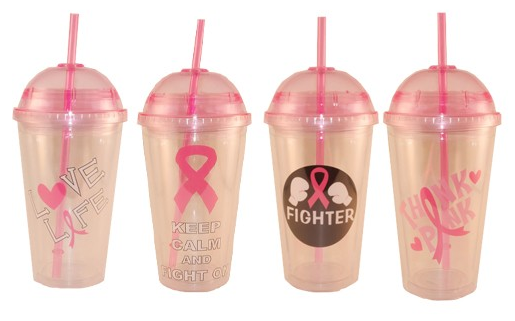 Taking your favorite beverage on the go has never felt better than it does with these dome cap tumbler cups supporting breast cancer awareness. These cups come in assorted styles, each one featuring a breast cancer awareness pink ribbon graphic. The cups also have a domed lid so you dont have to worry about any ice causing your drink to overflow. Cup designs are chosen at random.